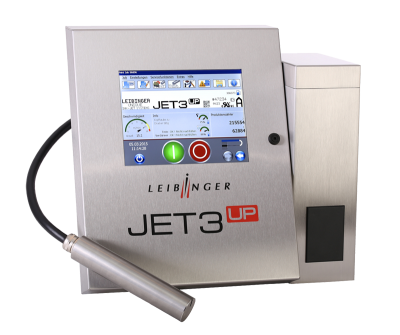 Jet 3up – Leibinger – Innovative Marking Systems, Inc. The LEIBINGER JET3up industrial inkjet printer is the perfect solution for all your product marking requirements thanks to its wide variety of functions. Glass, films, cans, cardboard, cables, wood, plastics, metal and steel are marked without contact by the JET3up continuous inkjet printer (CIJ printer) during ongoing production. Special inks are used that dry in less than one second. At speeds of up to 10 m/s, any product surface—convex, concave, rough or smooth—can be marked with fixed and variable data. Thanks to the development and production of all printer components in Germany, industrial inkjet printers from LEIBINGER represent the highest level of quality and reliability in product marking. The automated Sealtronic nozzle seal always prevents the ink in the printhead from drying out. Together with Clean Instant Start and Stop Technology, it also ensures that the small-character inkjet printer start up on the production line every time without needing maintenance. The Sealtronic nozzle and integrated Solvent Saving Mode keep solvent consumption to a minimum to reduce operating costs. In addition, solvent consumption savings of up to 50% can be achieved by using the Ecosolv option. “Sealtronic“, the automated nozzle seal in all LEIBINGER industrial inkjet printers, closes the nozzle and gutter airtight. This keeps the ink in the print head from drying out – the industrial inkjet printer is always ready to use. No time-consuming cleaning is required, even after long downtimes.